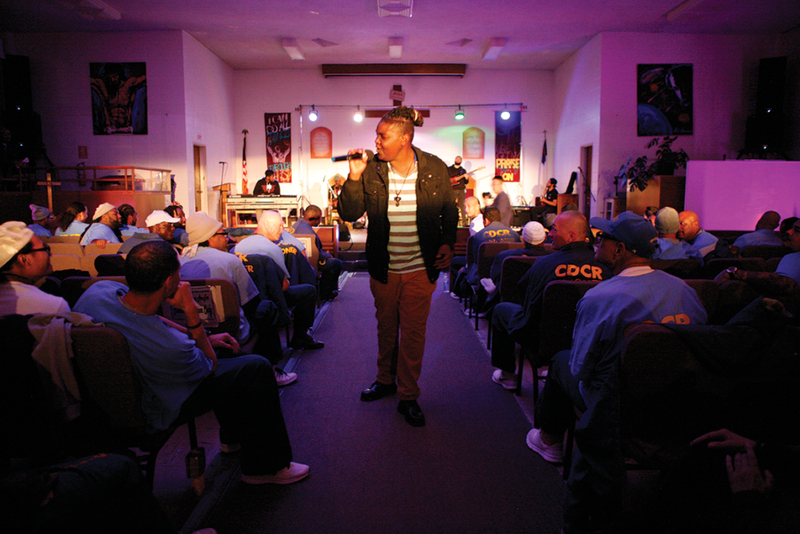 From an Oakland street corner to San Francisco’s “Tenderloin” district to San Quentin State Prison, the music of freestyle collective Curb Service screams of power, truth, harmony and love—lots of love. 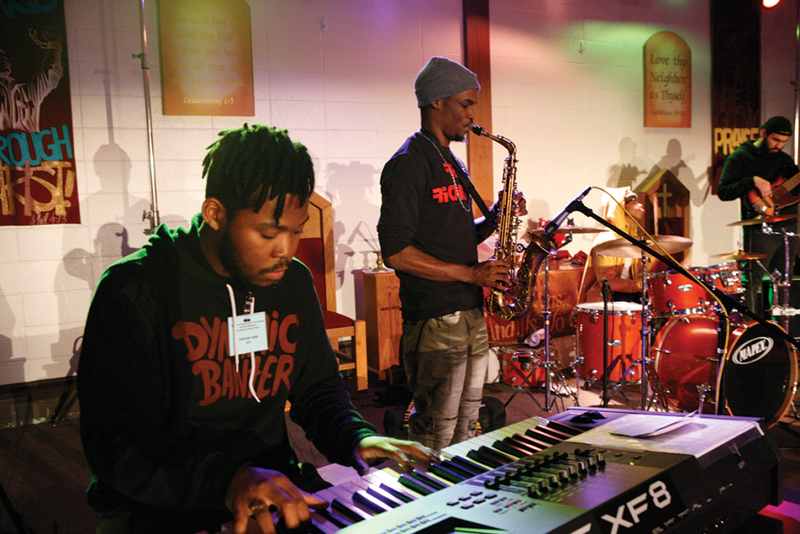 They arrived at the prison on Feb. 22, six men and one woman who would soon erupt from their quiet demeanors to become superstars for an hour and a half in SQ’s Chapel B.
Freeman, who goes by the stage name “KJ Focus.” He’s the high-voltage saxophonist. During the band’s warm-up and mic check, everyone stopped what they were doing to listen while Freeman went off on drums and Curb Service’s young “Drummer-boy” Aaron Davis riffed an impromptu bass line. Woods, the creative force behind the lyrics, found his true voice while serving a prison sentence at Terminal Island Federal Penitentiary. He put performing at SQ on the top of his bucket list after reading about the great musicians that have played here in the past, like Johnny Cash, Santana and Metallica. “I want people to see that no matter what the situation is, whatever the problem— even if you think it’s the lowest point in your life—just channel your energy into good intentions,” Woods told SQ News. “More doors will open for you as soon as you leave these gates—be prepared. 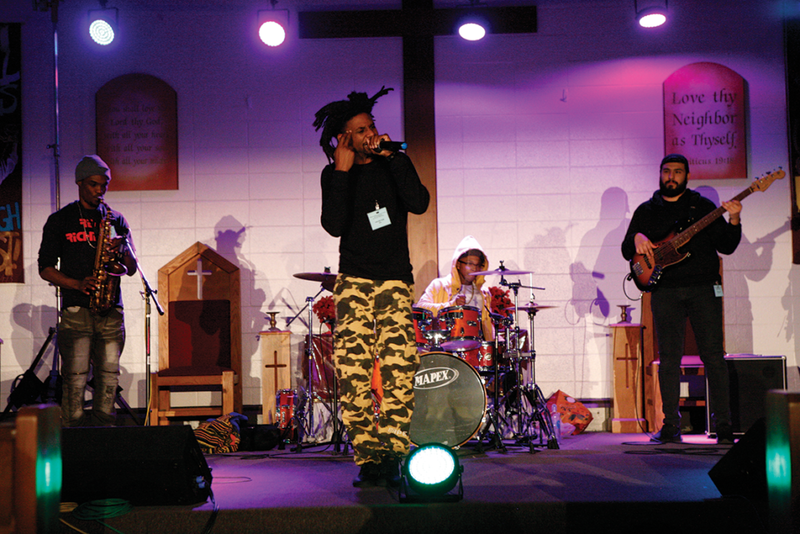 Besides its core three members, Chapman explained how Curb Service incorporates other artists into the mix, like vocalist Ama, keyboardist Jelani, bass player Chris Balderas and guitarist Joshua Parada. Depending on their individual schedules, the line- up flips and evolves from day to day and venue to venue. Before the set began, Woods talked about the playlist and about the two songs he wrote while incarcerated, “Long Gone” and “That’ll Be Cool”. Rodney Rederford popped into the chapel to peep the scene before running late to his college class. As soon as he and Woods made eye contact, Woods stopped the inter- view for a brief moment. “Hold up real quick,” Woods said as he turned to a photographer. “Can I get a shot with my boy right here?” Rederford and Woods quickly stood together. Rederford agreed. “I didn’t give it too much thought,” he said. “It was probably the energy or something.” After listening to the first half-hour of the show, Rederford reluctantly hurried off down the hill to his class. Woods called SQ’s music director and sponsor, Raphaele Casale, onstage to thank her for inviting Curb Service into the prison. Curb Service immediately captured the SQ crowd with an undefinable sound of their own. Was it Hip Hop or NeoSoul? Rock ’n’ Roll, or maybe Jazz Fusion? These elements were all in play, yet the dynamic hybrid proved far greater than the sum of its parts. About one hundred onlookers sat spread throughout the chapel at the start of the show. After each song, more and more of the crowd stood in appreciation and cheered, while men from North Block and H-Unit filled the space to its 373-seat capacity. A man of his word, Woods fed off the growing crowd’s energy, strutting up and down the aisle while unabashedly spitting his lyrics left and right and putting his vocal arsenal on full display. Near the end of the first set, Woods took a break while KJ Focus blasted through a saxophone solo. The riff-filled rollercoaster ride had everyone pumped up and on their feet. Balderas, Davis and Parada all got individual turns to show off as well. After Woods’ eight songs, vocalist Ama rose from the choir side area to perform three songs of her own. Casale came onstage with her to give a quick shout out to Big Giant Lighting, the San Francisco-based stagelighting crew that came into SQ with Curb Service. Ama’s resonant voice got most of the crowd dancing up from their seats during her first song, “Fool Over Love.” Some guys bounced into the aisles so they’d have more space to really get down. Hamisi X. Spears has been incarcerated since 1995, the last four years at SQ. He became overwhelmed by the infectious rhythms and Ama’s vocals. Feeling the vibe herself, Ama grooved her way down from the stage and continued singing from amongst the men. Surrounded by blue shirts and happy faces, she let the crowd know: “I met some amazing men here today. You guys are powerful. “Don’t ever forget, my brothers, wherever your mind goes—you go. Let your mind go to prosperity…to the light…to the truth… That’s where you’re gonna be. He pointed to his father, T.L. Woods, who made the trip to SQ. “My dad’s the one that showed me: You may be in the dark, but you’re never in the shadows,” Rob Woods said. After it was over, Curb Service had all the lights turned on in the chapel, and Woods asked all the men to gather up front to take a panoramic photo to commemorate the event.